In our fragment-based drug discovery projects, we constantly think about new ways of stitching together heterocycles. It is particularly satisfying if we find a way to make completely new, previously unexplored, chemistry matter. As you might imagine, herein lies a dilemma. On the one hand, we want high ligand efficiency, which goes implies relatively small size. On the other hand, try to plug something completely new (for instance, a 6-membered ring) that is composed of common heteroatoms into SciFinder. Good luck with that. Chances are, your composition of matter has been disclosed in a patent or, worse yet, published in peer-reviewed literature. Challenges notwithstanding, we recently bravely embarked on a journey that has sought the discovery and development of new kinds of small and medium rings. One of our favorite examples is the so-called boromorpholinone, which is obtained by plugging a boron atom into the framework of a well-familiar morpholinone scaffold. You see a model of a representative member of this class of compounds in the graphic below (boron is green). Earlier this year, Aleksandra Holownia (pictured below) joined our efforts as a Summer undergraduate student. 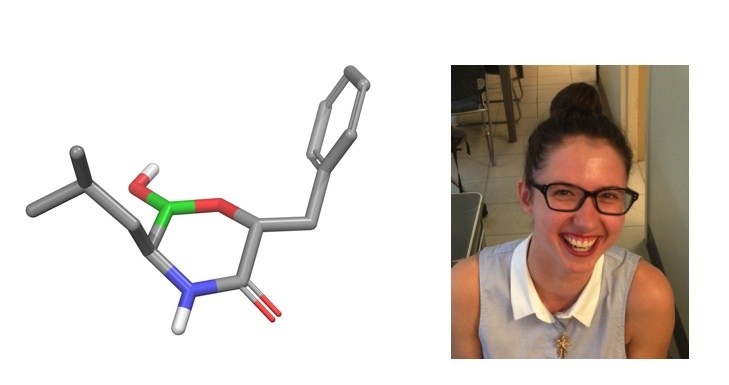 Under the direction of my graduate student Adam Zajdlik, Aleksandra not only helped us understand the boromorpholinone area better, but earlier today won one of the AstraZeneca poster awards. I applaud her dedication to this project. As you might imagine, the boron atom in these sorts of rings is not going to be an innocent bystander. There are, in fact, many applications that await these compounds, which is something we are engaged in together with Ben Cravatt at Scripps. Speaking of Adam, he just came back from a one month internship at Anacor in California, where he further learned about the use of boron. Anacor is the pioneer in the deployment of boron-containing molecules in drug design. There are myriad reasons to like boron and I will give you just one: boric acid, the main metabolite of organoboron therapeutics, has LD50 of 2.7 g/kg. This toxicity is comparable to that of table salt. Once again, congratulations, Aleksandra! This looks accessible, with synthetic methods (I presume you started with alpha aminoboronic acid). If you want novelty from a composition-of-matter patent standpoint, any fused (even non-aromatic) ring added onto your boron heterocyclic system creates new structural class. In this respect, alpha-lithiation of Boc protected pyrrolidines and piperidines, followed by B(OR)3, would be an easy entry point. Another thing work looking into are acetyleneboronic acids. They are commercial, they do Diels Alder with dienes, and they add PinB-BPin to form R(BPin)C=C(BPin)B(MIDA), which can be turned into RR’C=C(BPin)2 by Pd coupling and boron ester exchange. Also, I would recommend to keep the new boronic-acid derived things as simple as possible and low molecular weight, like Anacor does with all their clinical candidates, and do phenotypic screening rather than attempting a rational drug design. Thanks a lot, this is very much consistent with our strategy. It is very interesting to hear these kinds of points (especially regarding Mw). Adam and Aleks – take note! Oh this is very pretty and opens lots of possiblities, I was not aware of the isocyanate to isonitrile reduction. I completely agree about the N-methylation! this reminds me, with regard to novel ring systems – please have you looked at salicylaldehydes or o-acetoxy-benzaldehydes, as your isonitrile acceptors? You know, this is on our to do list… Keen on 7+rings as well.